COVINGTON, Ky., Dec. 6, 2018 /PRNewswire/ -- Commonwealth Hotels is pleased to announce the appointment of Phil Klaus to the position of general manager at Hampton Inn by Hilton Louisville North/Clarksville. In his role as general manager, Klaus will oversee hotel operations, sales, and community and guest relations – focusing his efforts on driving revenue, controlling costs and ensuring guest and associate satisfaction. Klaus has over 20 years of experience in the hospitality industry. He has held various general management positions for hotel brands Hyatt, Marriott, IHG, and Best Western. Klaus has been with Commonwealth Hotels since 2008, when he served as opening general manager for Candlewood Suites Indianapolis-South. Most recently, Klaus was general manager of the Courtyard by Marriott Cincinnati Airport. "We're excited to have Phil continue his growth within Commonwealth Hotels and take on the general manager role at the Hampton Inn by Hilton Louisville North/Clarksville," Area Director of Operations Craig Baughman said. "Phil has demonstrated excellent leadership skills to drive revenue, improve guest satisfaction scores and improve the overall profitability of his hotels." Located at 1501 Broadway Street, Hampton Inn by Hilton Louisville North/Clarksville is conveniently located near the Green Tree Mall and only ten minutes from downtown Louisville. 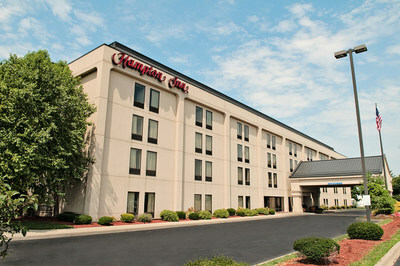 To make reservations or for more information please visit https://hamptoninn3.hilton.com/en/index.html or call the hotel directly at 812.280.1501. Guest rooms have all recently been remodeled and feature either a king size bed or two queen beds, free high-speed Internet access and a spacious, ergonomic work desk. Additional room amenities include in-room microwave and mini-refrigerators, coffee station, iron and complimentary weekday newspaper. The lobby features a full hot breakfast daily from 6am-10am and complementary coffee 24/7.